Kadalebele chutney reminds me of my newly wedded days. Me, my mom-in-law, my mom & few other close relatives used to roam around Devraj Urs Road, Sayyaji Rao Road & other famous shopping streets in Mysore to look around for nice sarees to be purchased for ourselves & also to present our relatives. We used to stop by in Paras, Nalpak & other restaurants to satisfy our hunger pangs. And my mom-in-law used to always complain that I eat very less & she was right too!!. After marriage, as I have told countless number of times before that I got introduced to a completely different & interesting cuisine. I started enjoying the new cuisine & got addicted to this food very much. Slowly, my apetite improved. 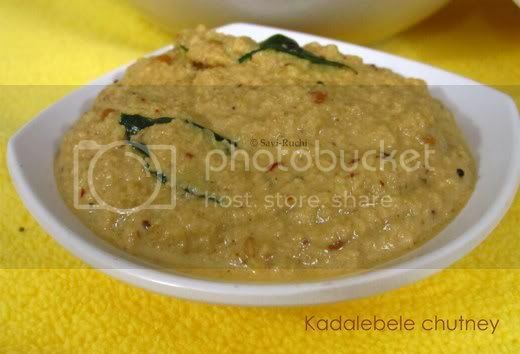 One such recipe from the newly introduced cuisine is kadalebele chutney. My mom-in-law also noticed the change in my apetite & told my hubby about the improvement in me. Whenever we visit them, she used to either prepare this chutney or menthya chutney(will write about this very soon). 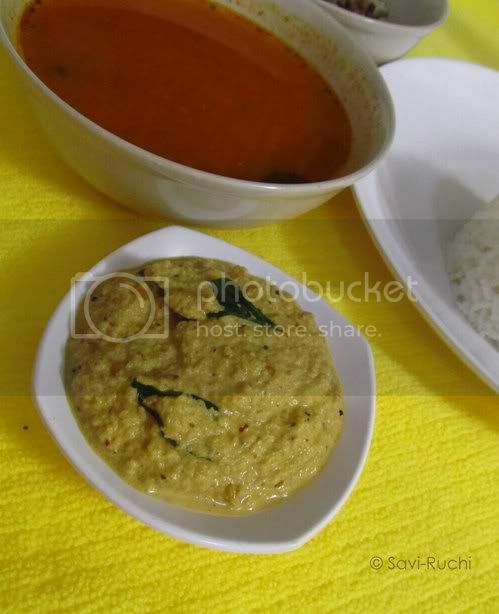 This chutney tastes awesome with rice, rasam & also with shamige (home made rice noodles). I would consume atleast double my capacity when this chutney & rasam are prepared at home. My hubby’s aunt knew about my love to shamige & this chutney. So, she has prepared shamige & sent it all the way from India few days back, when my hubby returned from there. I was elated & very happy seeing the fresh handmade rice noodles. As soon as I saw the rice noodles sent by her, you all would have guessed what I would have done?? I prepared this chutney at home & relished the rice noodles with kadalebele chutney all 3 times on that day. Heat coconut oil in a small pan, when oil is hot, add cumin seeds & channa dal. Saute the channa dal until it turns golden brown. Add, broken red chillies, curd leaves & sauté for 30 secs. Switch off the flame & add asafetida. Allow the mixture to cool. Grind together the channa dal mixture, coconut, tamarind extract by adding little water. Make a smooth paste & scoop out the chutney to a bowl. Add salt to the chutney prepared & prepare the tempering by following the usual procedure. 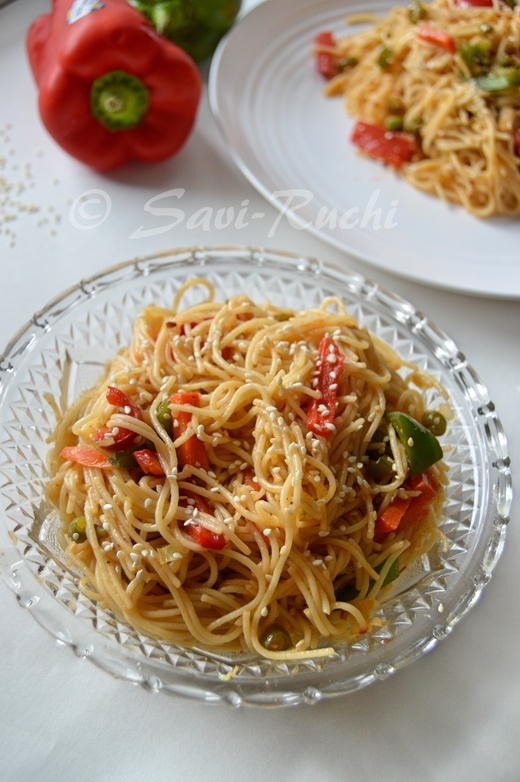 Pour the tempering on the chutney prepared, mix well & enjoy it with rasam rice, rice noodles. Heat oil in a small pan, when oil is hot, add mustard seeds. When mustard seeds splutter add curry leaves. When curry leaves become crisp, switch off the flame, add asafetida & pour the hot tempering on the dish prepared. I have once tasted this chutney but it was long back..looks like it is time to try again..chutney looks spicy Sush.. I too love this chutney. try adding onion instead of Cocunut. My MIL 's idea. diff flavour and taste but increase the chilli. I made this chutney... Followed ur recipe. it was fantastic !! !